My grandmother had three newspapers on her kitchen table over the course of a week. The Lake Geneva Regional News, the Milwaukee Journal or the Milwaukee Sentinel, and the Janesville Gazette. Ink-stained fingers over breakfast was normal – and I loved reading the pages. Various adventures at publications and newspapers, as time passed, prompted me to start thinking a bit about the profession of gathering news and the process of sharing it. Publications had become noticeably slower than the people talking about the news. Or, perhaps it was simply that the conversations people were having about the news became more evident with the rise of social media. I started hearing about news online in my social circle before I heard the news on the radio, or read it in the newspaper. That had also happened through the rumor mill before social media came around, but social media and the Internet went beyond the rumor mill: it was written, which made it seem more permanent, regardless of how trustworthy it was. News was happening immediately. And from the perspective of a young person growing up through this incredible transition, if news sources were not current in the midst of this mess, they were laughable. Around this time I met my husband, Andrew Broman, while we worked at The Daily Press in Ashland, Wis. Honestly, I was on my way out to “the dark side,” as those familiar with the news industry call the field of marketing and public relations. But this propensity on my part to embrace questionable circumstances did not deter Mr. Broman, who also had extensive journalism adventures by the way, from acquiring my affections or my hand in marriage. We are a fun-loving, serious couple, I would say. And from the get-go a lot of our conversations had to do with “what if” scenarios. What if this? What if that? One of the what-ifs involved a dream Andrew had, which was to start a newspaper. Having started publications in the past, albeit small ones, and having worked at a number of publications over the years, I knew how much work such a start-up endeavor would involve, and so I balked. For two years Andrew questioned me. Why not? It would be fun. We could write the news, help set the political priorities, be a resource for the community. And I said no, each time. And then, for some strange reason that I do not now remember, one time I said OK, but I need to see a business plan, and that’s when we seriously started thinking about how what would become the Ashland Current, would come about. 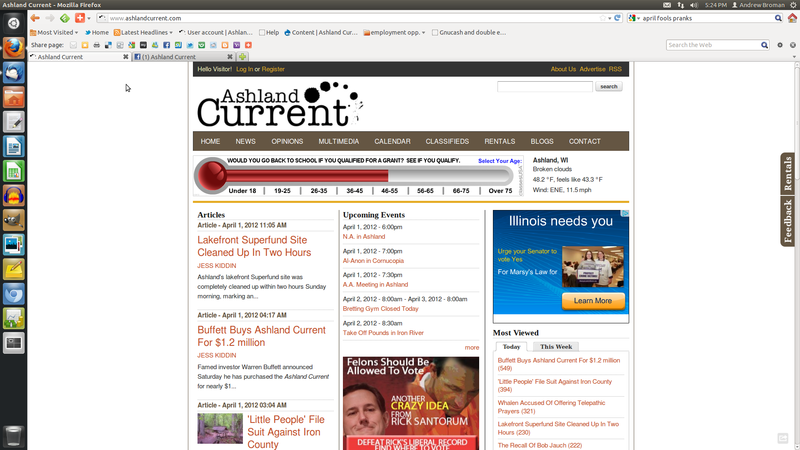 A screenshot taken during the operation of the Ashland Current. We brainstormed nonstop about business models, story ideas, formats, viability, finances, and logistics for months before Andrew and I approached Tristan Fitzgerald to see if he would be interested in being a part of an online news publication. To our surprise he not only wanted to be part of it, he wanted to dedicate himself to the extent that he would also own it with us. And we said “yes” to that, too. The three of us met for a good part of a year to plan the business model, juggling jobs, meetings with like-minded people in other communities, friends, life, and continued educations. Our sights were set on the Ashland Current being more of a side project than a full-time effort, and that’s how we developed our initial plan. What started out as a dream became reality in June 2010 when Andrew, Tristan and I launched the Ashland Current, and we became more successful at developing a loyal following of readers than we ever expected. These numbers led me to believe that we could depend on 1 million page views for the Ashland Current, if our readership remained static. As of May 31, 2012, when I looked at the data for the year reaching to May 31, 2011, we’d surpassed the 1 million page views mark for the year – we had 1.22 million from May to May. It was amazing. Our readers came from all over the world and have hailed from all 50 states, with the majority of our readers coming from Wisconsin, Illinois, Minnesota and Michigan, including statewide interest throughout Wisconsin. Most of our Wisconsin readers were in the Chequamegon Bay region, followed by the state metro areas. With this widespread success came an opportunity for my family – Andrew is now editing a newspaper in Minnesota, about an hour or so from the Twin Cities. It’s a great chance for both of us to learn more about the industry from another perspective, and it also means that we’ve had to step back from doing as much as we did with the Ashland Current. Andrew fully moved on from the Current in mid-April, while my role continued until May 31, 2012 to make it possible for a more extensive transition. I was hopeful that the feisty online news and information portal would continue well into the future, but no proposal we received allowed for shared ownership, which was our main goal. So, the time came to hit the “off button” as we say in the world of technology, and to move on to our next phase as creatives, as entrepreneurs – and as a family. Still, knowing what I know now, and having gone through all that we did to research, create, operate, and close down the Ashland Current, I would do it all again. I learned an incredible amount about business and teamwork, and these are lessons I could only have learned in the midst of the day-to-day operations. I am extremely thankful to the readers who made the Ashland Current possible. Tristan, Andrew, and I worked hard over the past years to provide a community-driven and dependable product. It was inspiring to see how many of our readers believed in the power of real, local news.